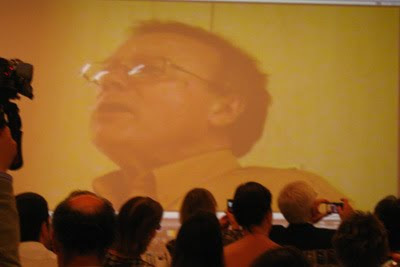 Cult of the wine critic: Charles Metcalfe addressing his followers! 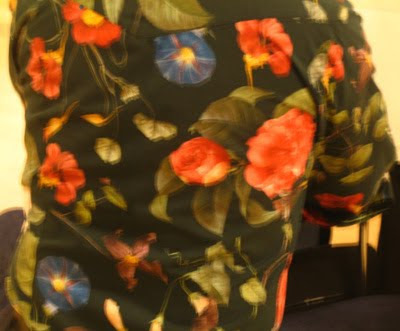 To round off the 2nd European Wine Bloggers Conference Charles Metcalfe tutored a brilliant tasting of eight Portuguese wines, which had a very high strike rate. Made mainly from a blend of Avesso and Chardonnay with a small percentage of Gewurztraminer, this quite aromatic wine has an attractive combination of weight and mineral freshness in the finish. 100% Fonte Cal giving weight and concentration but with some minerality in the finish. More evidence of the quality of an increasing number Portuguese whites these days. 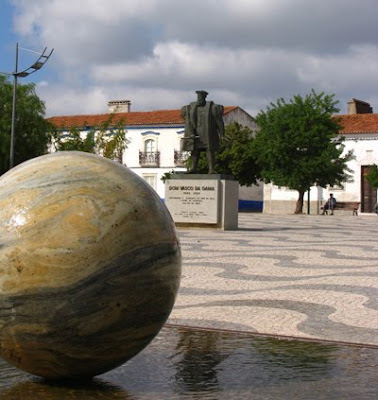 From the Vinho Verde, Vinhão is a tenturier grape with very high acidity. Made by Vasco Croft, whose estate is in conversion to biodynamics, this has 12.5% alcohol and 7g of acidity. The wine has sufficient concentration of fruit to make this work. Charles recommends this with grilled sardines. I fancy it would also work well with roast suckling pig. From the Algarve – sweet toasty, plum and prune fruit balanced by acidity and a touch of leafiness in the finish. Lovely new style Madeira from single white variety – Barbeito – nutty concentration with quite austere concentration in the finish. Beautiful complex wine. 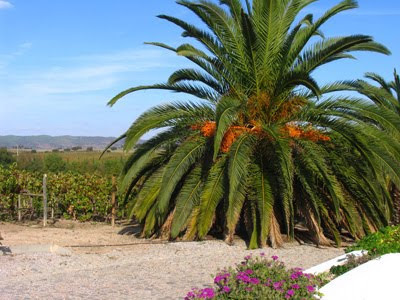 Each wine is linked to the Adegga site, which provides links and details on the wines. Unlike many participants at the #EWBC conference I opted not to take my laptop with me – I didn't fancy lugging it about with me all day. Probably if Macintosh had a small, convenient notebook it would be different. Also I prefer to listen to what people are saying and make a few notes. If I had my laptop I'm sure I would have been distracted. Unsurprisingly there is a strong presence of Mac users at the conference. Difficult to say whether they are in the majority but certainly a far higher percentage than overall market share. A topic for next year's conference: new social media and the rise of the new jargon. There is a wide range of experience here – some very sophisticated bloggers and twatters – others just starting out. But as Doug Cook (ablegrape) emphasised in his presentation and echoed by others – it's the content that counts. Apart from Doug Cook's session I have found the technical sessions away from the main hall the most useful, although it is now a question having time to explore the array of sites and gadgets mentioned. Some Campogate (as dubbed by Justin Roberts) ripples around the conference, especially his no show for the Vinoble tasting last night. Brief thought for the day: will I succumb to twatter? The five Douro boys took centre stage tonight. The biggest of the whites with toasty weight but with minerality and lemony freshness in the finish. The 2nd European Wine Bloggers Conference has opened in Lisbon late this afternoon. The first tasting on the programme is a presentation of Vinoble and a sweet wine tasting with wines from Spain and Portugal. 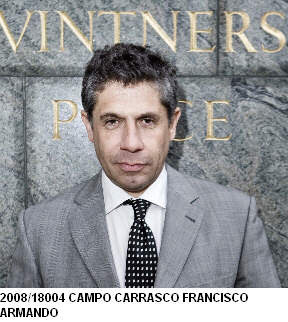 Despite Pancho Campo MW having a conviction for fraud and an unserved prison sentence in Dubai, the owners of the bi-annual Vinoble, have seen fit to give the contract for organising the 2010 to Pancho Campo and his Wine Academy of Spain. I'm sure that the presentation and tasting would have been worthwhile and interesting but I, for one, am going to have nothing to do with Vinoble until Pancho provides detailed answers to the questions I have been asking. Pancho Campo had been expected by the EWBC organisers to do the presentation instead Esteban Cabezas, marketing manager for The Wine Academy of Spain but clearly didn't show. 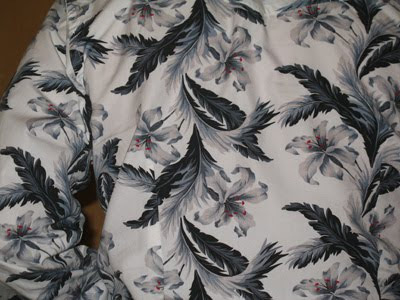 Many must have wondered – "Where's Pancho?" In the absence of (Doctor) Pancho, Esteban Cabezas, marketing manager for The Wine Academy of Spain, stepped into the breach and did the presentation. I gather from bloggers at the presentation that Esteban did his best but was nervous and easily flustered by questions. Not surprising as this sort of presentation probably isn't normally his role. Not Esteban's fault if his boss hasn't the cojones to fulfill an engagement. 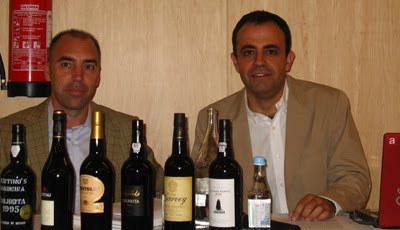 The people from Jerez must also be wondering what the point of hiring Pancho Campo MW was to promote Vinoble 2010 if he sends his assistant, so that Pancho doesn't have to face awkward questions. PS (31st October): Had a very quick chat with Esteban (The Wine Academy of Spain) at lunchtime. 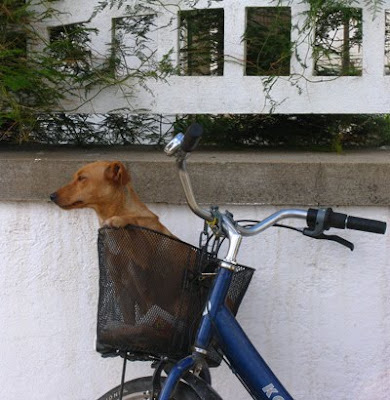 Jim: "When you see Pancho please tell him I'd like some answers." Consejo are also chipping in 50 grand. Had an enjoyable evening at Gemelli, the Italian restaurant run by Augusto Gemelli on R. Nova da Piedade/ Rua de San Bento. Good to see people I'd already met and to meet a number of new bloggers, who hopefully I will get to know better over the next few days. More details to add, including wines tasted, etc. Now off to the opening session of The European Wine Bloggers Conference. 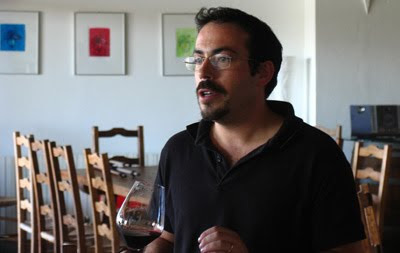 There are rumours that (Doctor) Pancho Campo MW might show up for the Vinoble tasting. if so will be an intriguing opportunity to aks him for some answers about his fraud conviction and funding of the Wine Academy of Spain. 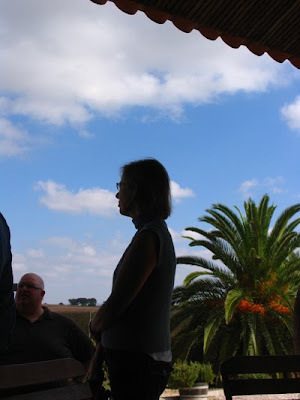 My only previous visit to Cortes de Cima was in mid-December 2003, so it was good to go back to the estate as the pre-wine bloggers conference visit and see Carrie and Hans Jorgensen Several motorised bloggers had arrived before us, including Wink Lorch, Brett Jones and Justin Roberts. 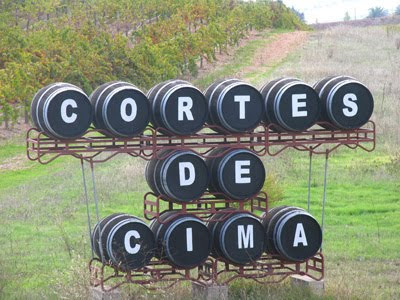 Cortes de Cima now has 150 hectares of vines planted on the 370ha estate, which also has 50 hectares of olive groves. 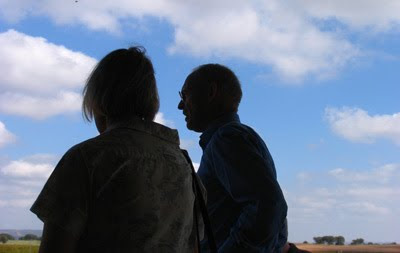 We started with a short chat on the edge of the vineyard with Hans explaining how they are trying to expedite grape ripening to encourage the phenolic ripeness before the grape sugars rise too high – to obtain ripe wines without high alcohol levels. The experiments include tailoring the canopy to provide protection for the bunches from blistering early afternoon sun and careful management of the drip irrigation. 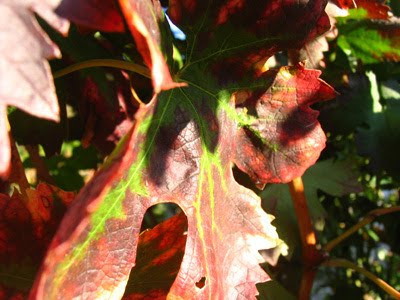 About three years ago, at the London Wine Trade Fair, Chris Handcock of Bob Oakley Wines (Australia) explained that the acquisition of grape sugars occurs over quite a wide range of temperatures, whereas phenolic ripeness happens in a such smaller range. Thus temperatures over 30˚C pushes up the sugar, while phenolic ripeness slows or stops. This seems to explain why in very hot years there can be a big discrepancy between sugar levels and true ripeness. Following an excellent buffet lunch we moved on to the tasting of the Cortes de Cima range with a video blog connection to Wine Bloggers installed in the VIP conference hotel at Entrecampos, Lisbon. I have to say that this video link wasn't a great success. Although the tasting did provoke a considerable volume of twattering, the video link was rather reminiscent of the happy hours spent during the 1950s studying the BBC test card. It also turned the tasting into one suitable for snails with impaired mobility. Technology can be great but there needs to be a purpose, which in this instance didn't appear to have been fully thought through. On reflection this link would have been useful if it had been set up for Hans and Hamilton, the winemaker, to have presented the wines to both audiences simultaneously and to have handled questions from the estate and the VIP Hotel. To adapt a well-known phrase the medium isn't the message – it's the messenger. Of the wines shown (details here) I was impressed by the crisp and lemony white 2008 Charminé (Viognier 38%, Antão Vaz 30%, Verdelho 26% and Semillon 6%) – good aperitif and with fish. The red table wine, Courela, made in years when some of the grapes are not good enough for Charminé Tinto, is an easy drinking, plummy bargain at around 3€. The current bottling includes some 2008 to round out the 2007. Production of the red Charminé is now around 1.2 million and you can see why it is a best seller in Portugal for around 5€. The 2008 has more structure than the Courela and plum and prune fruit. Ideally it needs another six months to a year in bottle to show its best. Moving up the scale I liked the concentrated rich and toasty 2007 Cortes de Cima – also needs more time as it's currently tight in the finish. Of the three pure Syrahs I preferred the stylish, herbal 2005 Incognito – opulent but more restrained than either the 2005 Syrah or the Homage to Hans Christian Andersen. On the other hand I could buy nearly three bottles of Homage (15€) to one Incognito (40€). The powerful and black fruited 2005 Touriga Naçional is also impressive with its coffee tones but I'm not convinced it is really worth 40€. 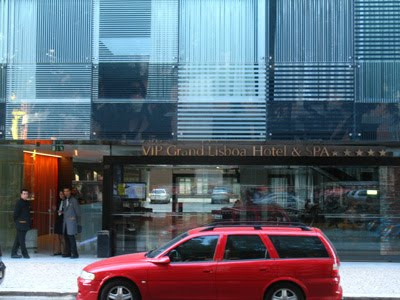 Got a lift with Justin Roberts to Lisbon with time to freshen up before heading out to Gemelli's restaurant. 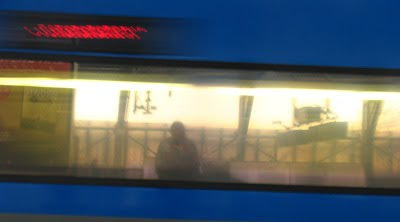 Took the train this morning from Entrecampos (Lisboa) to Cuba (Alentejo), which is the closest station to Cortes de Cima. There is something magical about buying a single ticket to Cuba. However, the three bloggers (per Karlsson, Sam Ockman – 1000 corks and myself), who had travelled together on the train to Cuba, were amazed to be told by the station master at Cuba that photos of the station are banned. 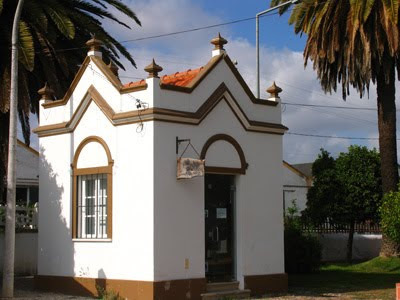 Quite what a sleepy little station in the middle of the Alentejo has to hide is very far from clear. Perhaps we really had travelled to Cuba! We were picked up by a mini-bus to take us to Cortes de Cima. Progress towards our destination with frequent stops for photo-ops including the statue in downtown Havana (sorry Cuba) of Christopher Columbus and then a statue of Vasco da Gama in nearby Vidgueira. Flew into Lisbon around 7pm last night on Queasyjet. Weather mild –up into the 20s. Met up at Rato with Per Karlsson, who is a very good wine photographer and who has also arrived early for the conference. Went to the Chafariz do Vinho where we had a bottle of Luis Pato's surprisingly rich white 2008 Vinha Velhas, which is a blend of Bical, Cerceal and Sercialinho grapes, with 50% fermented in stainless steel and 50% in second year chestnut casks for four months. 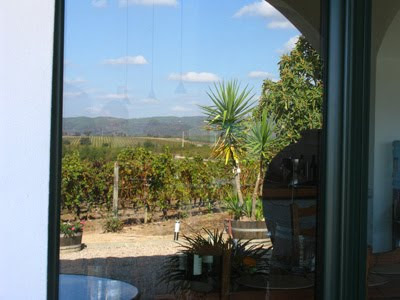 This morning it's misty and we will be off to Cortes de Cima catching a train from Lisbon to Cuba out in the Alentejo. In late September friends in Epeigné generously opened their only bottle of 2000 Silex. It was a wonderful wine and a fitting reminder to how good a wine producer the late Didier Dagueneau was. There are times when it doesn't make sense to break the wine down into its component parts – the fruit, the minerality, the aromas, the acidity, etc. The 2000 Silex was just wonderfully harmonious – a great wine period! 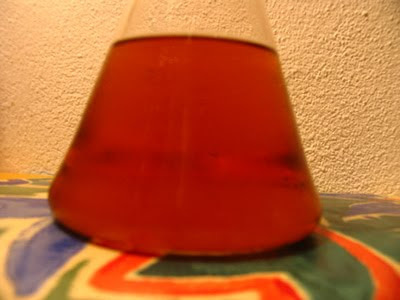 WineFuture Rioja09: do they know where the money came from? I’m sure that these are all prudent people and organisations, who will doubtless have demanded or will demand from Pancho Campo MW, detailed and convincing assurances that the proceeds of fraud in Dubai were not used in the founding of The Wine Academy of Spain in 2003. In these days of ever-stricter money laundering regulations no one would want to be associated with an organisation that might have been set up using the proceeds of a fraud. 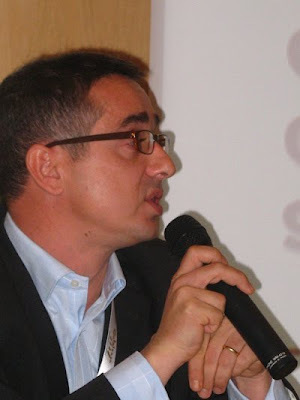 Dmitry Pinsky, Founder and co-owner of DP-Trade, the most important distributor and importer of wine and spirits in Russia. Esteban Cabezas. He is now a partner in The Wine Academy of Spain to develop the first Wine Business School in Spain. 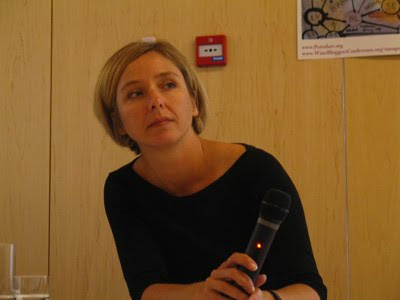 Felicity Carter, editor-in-Chief of German based magazine Meininger's Wine Business International. There is, of course, no suggestion that any of the speakers or sponsors of WineFuture Rioja09 had any involvement in the fraud in Dubai. Indeed it is highly unlikely that any would have known who Pancho Campo was at that time. There is a delicious irony here. Spain was once a haven for the British criminal fraternity until the Spanish authorities clamped down. Now, however, Spanish wine appears to be welcoming a convicted fraudster with open arms. 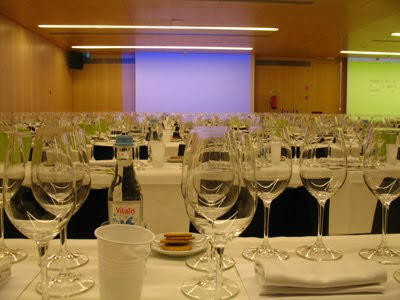 First with WineFuture Rioja09 followed by Vinoble 2010, the sweet wine festival held biannually in Jerez. But what legal response is this, pray? Pancho Campo was found guilty on 1st June 2003 of breach of contract – fraud and sentenced a year in jail, followed by deportation. Since the end of August PC has claimed to have a team of lawyers in Spain and Washington sorting this out. Are they appealing against the sentence? They originally claimed this was all a ghastly mistake? A miscarriage of justice! Perhaps, but so far not a shred of evidence, to show that this is the case. Both the criminal and civil cases against Pancho Campo are over – apparently there are no new fresh cases listed, so where is the wriggle room for the lawyers and for Pancho? 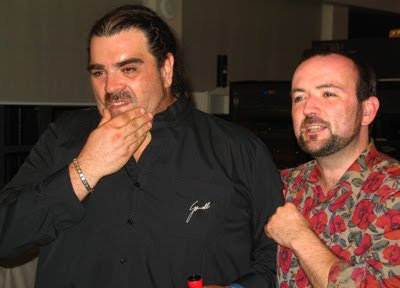 Doubtless Pancho’s posse of lawyers are working to good purpose but the only thing I’m aware of them doing is to have threatened American wine writer, Gerry Dawes, for looking into Pancho and his Interpol Red Notice. There is, of course, one definitive legal response: for Pancho Campo MW to return to Dubai to serve his one year prison sentence. How many people are charged in court with breach of faith involving a sum of 640,000€, surrender their passport presumably with their visa that allows them to work in the UAE, abscond from the country while awaiting trial and then forget all about the criminal charge until several years later when a red notice is issued by Interpol following a request from Dubai/United Arab Emirates? A parking ticket perhaps but a six figure fraud ...! 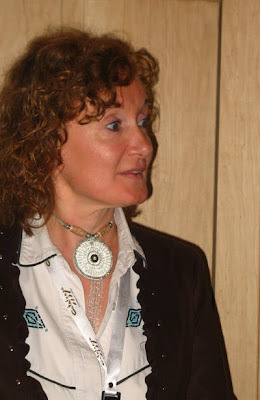 True there was civil case as well brought by Jackie Wartanian, Pancho’s business partner in Dubai, through her lawyer – Amma Al Jallaf of Ince & Co (Dubai) – but the fraud conviction relates to a criminal charge. This just doesn’t hold water. Pancho is still in the same line of business promoting events – this time it’s wine before, in Dubai, it was music and sports events. The only difference is that the egos of top music stars may be more fragile than those of wine industry luminaries. Follow the money trail is an old adage: 2003 Pancho Campo absconds from Dubai, is convicted of a substantial fraud and sets up The Wine Academy of Spain. “No link with wine, here.” Really! Then why won't Pancho Campo MW answer the simple question – what was the source of the money used to set up The Wine Academy in 2003? Furthermore I’ve seen enough of fraud trials in the UK to be aware that fraudsters have transferable skills. Also Pancho has gone out of his way, when building brand Campo, to use some of his past – participant in the 1992 Barcelona Olympic Games (coach to the one strong Chilean women’s team), organiser of Dubai concerts for Pink Floyd (the band have never played Dubai/UAE), etc. "This is just being stirred up by people, who don't like him or are jealous of his success." This is just a smokescreen – a diversionary tactic. 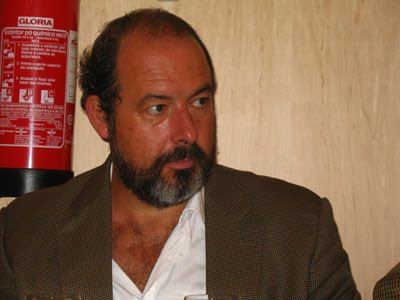 Pancho Campo MW may well have his enemies – successful, dynamic people often have their detractors. However, the conviction and jail sentence for fraud in Dubai isn't an invention nor is the possibility that The Wine Academy of Spain was wholly or, in part, founded on the proceeds of fraud. Pancho the solution to the speculation over the funding of the Academy is in your hands – answer the questions. "It has all been got up by the foreign press." Pancho Campo's conviction has had more coverage outside Spain but this is only because the quiescent Spain press have preferred to hold their noses, look the other way and peddle the transparent fiction that what happened in Dubai has nothing to do with wine in Spain. I would have more sympathy with Pancho Campo if his claims weren’t such an elaborate confection of falsehoods and facts so elasticated that they often bear a similar relationship as that between a bubble car and a stretch limo. In addition to Pink Floyd and 1992 Barcelona Olympics, claims about being ‘personally trained by Al Gore’ in climate change turn out to be far from a studious chat with the great man in a book-lined library but instead one of 200 or so people at a seminar in Seville. ‘Studied winemaking at the University of California at Davis’ – yes, two correspondence courses. A doctor of medicine, as claimed on Pancho Campo's Wine Future presentation (in Spanish), pt 1 by Zev Robinson (http://vimeo.com/4858630) ("Como medico que soy. . ." 9.40 mins in). Pancho may have studied medicine in the Dominican Republic but there appears to be no record of him qualifying. 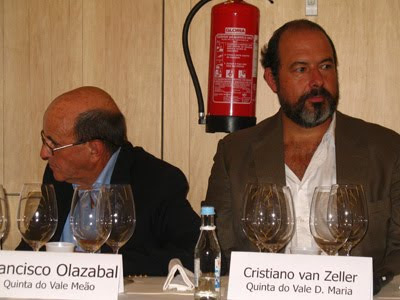 I emailed some questions to Pancho Campo MW yesterday. Unfortunately I have received no reply from Pancho, nor to questions emailed to him on 6th October 2009. 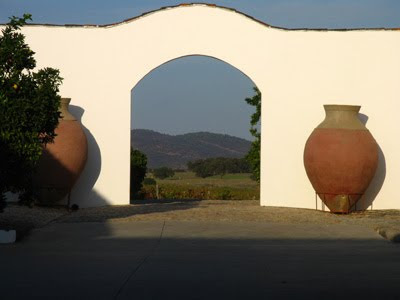 In particular he has declined to answer probably the most crucial question – what was the source of the finance used to set up the Wine Academy of Spain in 2003. Thus it remains unknown whether any proceeds from the fraud in Dubai were used to establish the Wine Academy of Spain. Copy of a letter emailed to Pancho Campo MW yesterday. 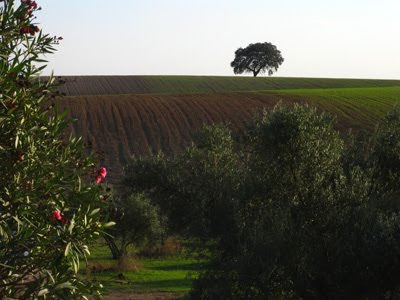 I’m sorry not to have received a response to my email of 6th October 2009) outlining the contents of the postings on Jim’s Loire (7th October 2009 – Pancho Campo – the essence and Pancho Campo – timeline. As I have had no response to neither my email nor to the two postings on Jim’s Loire, I assume you that are not contesting that the following events/facts are correct. 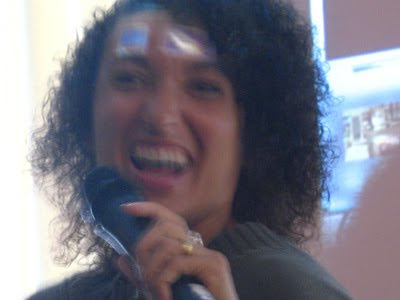 5th June 2002: You were charged with breach of trust in a Dubai court involving 640,000€. This is a criminal offence. You surrendered your Chilean passport to the court. There was also a civil case brought by Jackie Wartanian through her lawyer Amma Al Jallaf of Ince & Co (Dubai). Both the criminal and civil cases are now closed. February 2003: You left Dubai fully aware that you had been charged and that you would be facing a trial, although the date of the trial may not have been fixed at the time you left. You left Dubai using your Spanish passport. 2003 The Wine Academy of Spain was founded. a) When you were based in Dubai (UAE) did you have a tourist or a work visa? Was this visa in your Chilean passport? b) How did you leave Dubai in February 2003 – plane, boat or overland? Did you indeed use your Spanish passport? What type of UAE/Dubai visa was in it – tourist or work? How did you obtain a second visa? c) What was the name of your lawyer in Dubai? d) What was the outcome of the civil case? f) What was the source of the founding of The Wine Academy of Spain when it was set up in 2003? 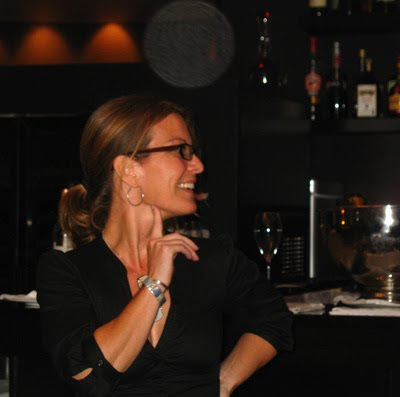 Was any of the 640,000€ on which you were convicted of breach of trust (fraud) in Dubai (1st June 2003) used to establish The Wine Academy of Spain? g) Does any profit made by WineFuture Rioja09 go to The Wine Academy of Spain? h) Pancho Campo's Wine Future presentation (in Spanish), pt 1 by Zev Robinson (http://vimeo.com/4858630) you claim to be a doctor ("Como medico que soy. . ." 9.40 mins in). Where did you study, where did you qualify and when? Have you ever practised as a doctor? i) You say that when you travel to Chile you use a Chilean passport. How did you obtain a new Chilean passport when your old one had been surrendered to a Dubai court? k) How do your lawyers expect to do anything about your conviction for fraud? Are you considering an appeal and, if so, on what grounds? I will be making a new post on Jim’s Loire at noon (UK time) tomorrow (28th Oct). 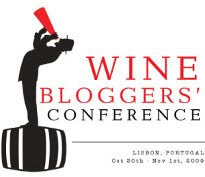 I'm flying off to Lisbon this afternoon for the European Wine Bloggers Conference (30th October-1st November). There is a pre-conference visit to Cortes de Cima tomorrow before the conference proper starts late on Friday afternoon. The number of participants has now reached 122. I'm looking forward to what should be a fascinating and very interesting few days. I'm hoping that, despite all the blogging, twittering – twattering, there will still be time to talk to each other! Made from 70% Chenin and 30% Chardonnay, this is the least convincing wine in the normally exemplary Ogereau portfolio. Not that it is badly made, it is just that a Chenin/Chardonnay blend tends to work better as sparkling rather than still. I fancy that this would be a more successful wine if it was pure Chenin. Philippe Germain's 2007 Anjou Blanc was the preferred wine in this series both by itself and with the skate wing as its clean mineral character, typical of 2007, showed well. I should probably give Thierry Germain, Philippe's elder brother, the credit for this wine as he is the winemaker. I thought Vincent's Savennières showed well with considerable complexity. Both wines illustrate that Loire whites are often as good from difficult vintages as they are from hotter, more acclaimed years. Unfortunately the 1991 Chavigné was completely stuffed – oxidised. It would have been fascinating to taste this as 1991 is now very rare because a single April frost reduced the overall crop to a third of normal. 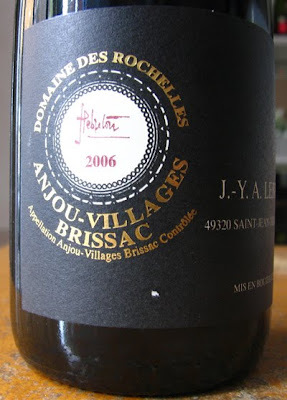 It was swiftly replaced by the 2005 Les Rogeries, which perhaps needed time to open up. 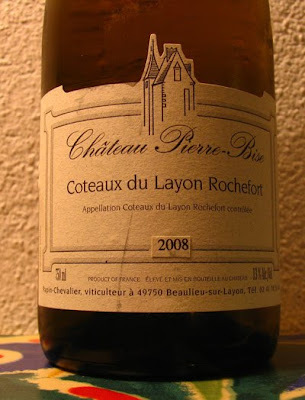 On this occasion the 2005 was rather dumb – very much in contrast to the 2004 which I drank in May, which was then sensational – rich, complex and balanced with clean acidity. 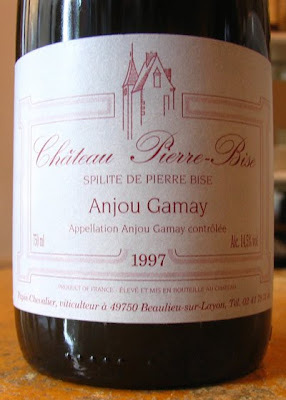 Replaced the 1997 Gamay, Anjou Gamay Château Pierre-Bise, which was unfortunately corked. This was a very interesting range of reds unfortunately again disrupted because of a problematic bottle – this time the cork. 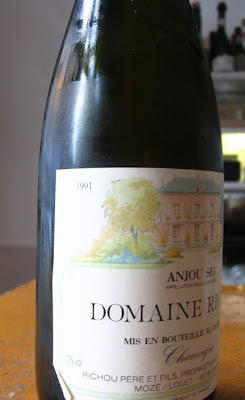 Possibly, of course, the oxidation of 1991 Richou was due to a faulty cork but difficult to establish. The 2007 Papin Gamay was attractive on its own – soft red fruits and quite marked acidity but without sufficient concentration to partner the lamb. Had the 1997 not been corked I think this would have fared better with the lamb. I thought the 2007 La Croix de Mission was showing extremely well – not a heavyweight but good ripe red and black fruits and well balanced. Yet another example of how having a good site in a difficult year can make all the difference, especially where Cabernet Sauvignon is concerned in Anjou. 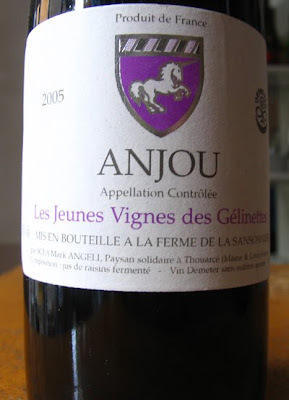 The concentrated and powerful 2006 Anjou Villages Domaine Ogereau was the favoured wine in this series, although less clear cut than the white trio. Ideally the 2006 needs another couple of years or so to further soften up. Drink the 2007s while you wait. 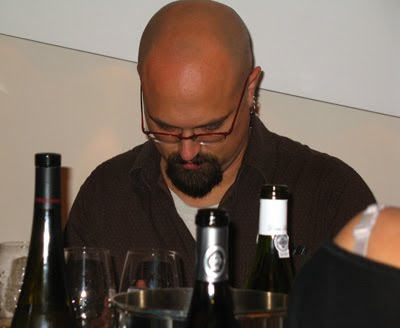 Mark Angeli's 2005 Gelinettes is certainly a petit bête – almost opaque, very concentrated, quite toasty and very tannic. It needs a lot of time and I have to wonder whether Mark didn't push the extraction too far or maybe it just needs time. If I didn't know Mark reasonably well I might accuse him of making a wine to attract the attention of a certain US wine critic but I'm sure that wasn't in his mind. To be fair to Mark, his 2005 showed much better with the lamb. 2008 is a difficult or perhaps unfulfilled sweet wine vintage in that everything was looking promising until the end of October and then frequent rain took over in November. Wines from grapes picked early have a lot of charm and purity but they don't have the complexity or concentration of a good Layon vintage. Enjoy them as an aperitif or with a variety of rich dishes but not with dessert. Also drink them young. 2007 in contrast is a lovely sweet wine vintage. There are wines here that really will go the distance. 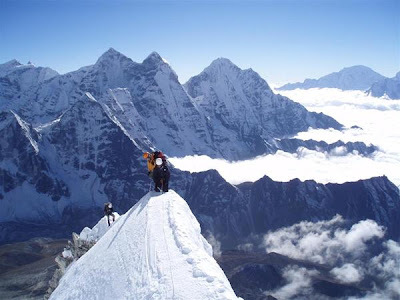 16 year old Calum Macintyre and the rest of the summit team reached the top of Ama Dablam on Sunday and are now safely back in base camp. It may be that Calum is the youngest person ever to have climbed this peak (22349 ft). Many congratulations Calum! A great achievement for a very good cause. He is raising money for The Teenage Cancer Trust. His sister, Esme, was diagnosed with a brain tumour three years ago when she was 11. Fortunately she had an immediate operation in Edinburgh on the rapidly growing tumour and has been making a slow but steady recovery ever since. Calum's target is £5000 and he has now reached £3320 (66% of the target). When Gift Aid is added in the total raised climbs to £4108.47. It would be great to see Calum reach his target. Any donations would be greatly welcomed. Details of the project are in the initial post here and further details are here on the justgiving.com site and also on Sandy Allan's teamascent blog. Sandy is a qualified International Mountain Guide and is accompanying Calum and Dave, Calum's father. Calum is my partner's nephew. Calum's total has now reached: £4804.50 plus £1079.55 gift aid making a total of £5884.05. Cabernet Franc like 'red sangria'! Insects – le vrai goût de terroir? Crucial week to come – weather looks iffy! 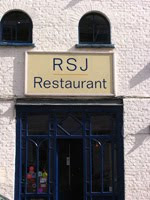 Rillettes de Tours to be a protected name?